Two DAF 575 Diesel engines with 120 Hp, with 3200 hours each, keel-cooled. Cons. 5l/h/engine at 1700 rev/mn approx.12 km/h. engines start with 4 batteries ( 130A/h). 6 domestic batteries of 130 A/h. Quality built steel cruiser with lots of wood features. Companionway from the well protected aft deck, 5 easy steps down to the saloon. Bright and spacious saloon, the saloon seating can be used as a single bed (80 x 190 cm). Double glazed windows throughout the saloon. Aft cabin or master cabin with a double bed (160 x 200 cm), lots of storage, ensuite heads and shower. from the shower room, a watertight door accesses direct to the engine room. Forward, a well appointed galley with all the conforts of home:dishwasher, oven, cooker etc..a good work surface and storage. Dinette converted into a 130 x 190 cm double. Forward cabin, V berth 80 x 190 cm, second heads and sink. Headroom almost 2.05 everywhere. Hot water by electric immersion heater (40 litres) easy connectable to the engine system and or instant gaz water heater. Blown warm air central heating. Generator under cocoon. Rare: this Kotter is equipped with 2 blackwater tanks. A complete cockpit cover is available with the boat. Automatic pilot, echo sounder for rivers or inland navigations. Need to be updated if sea navigation is considered. Dutch steel cruiser for sale in France. 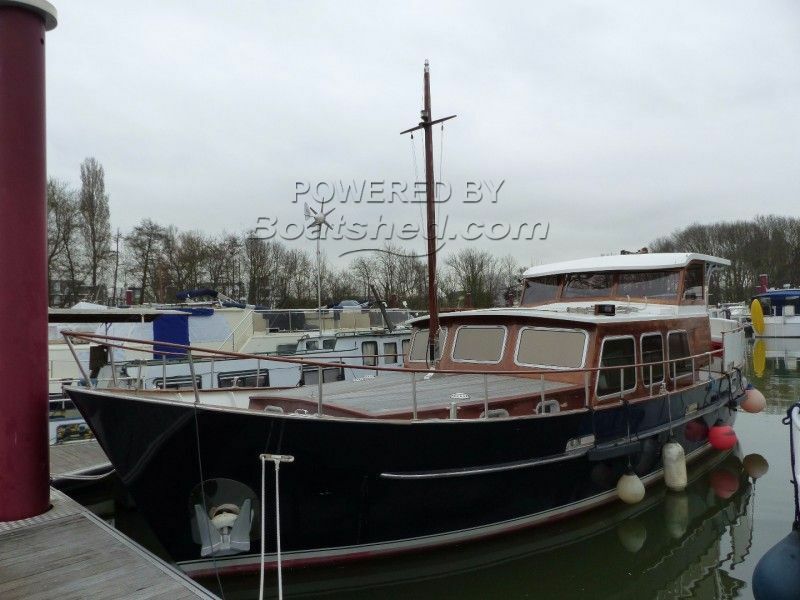 Boatshed Paris is pleased to offer this 14 meter Dutch Kotter from the famous STELLA MARRIS yard moored in the south of Paris. This classic Kotter features lots of wood, teck deck, great paint work and a confortable lay out, with two separated cabins, a cosy, bright and spacious saloon. Huge and convivial aft deck, 3 quarters covered by a wooden top. Ideal for cruising on rivers and coasts, also able to navigate on the canals, a great dutch steel cruiser for exploring Europe's waterways and beyond. Ideal all year long live aboard or pied-à-terre near central Paris, mooring could be transferred. For more information or organise a visit, please contact, Pascal GAETAN, your broker at Boatshed Paris. This Dutch Kotter Stella Maris 14 has been personally photographed and viewed by Pascal Gaetan of Boatshed Paris. Click here for contact details.